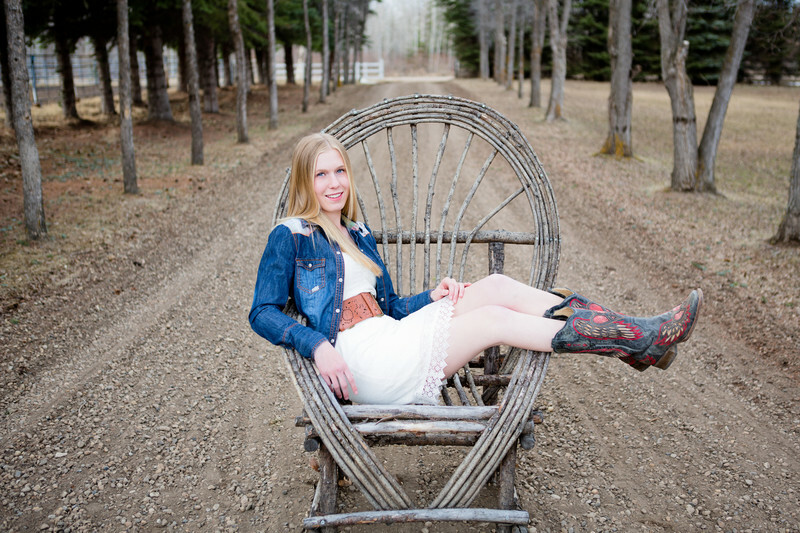 Our Grad photos with Casey-Ann took place in April at her parents house just outside of Spruce Grove. When we asked her what her interests were there was a common theme with horses and country music. We wanted to incorporate as many of her interests as we could. After walking around the property we found that the driveway was a perfect spot to start. The trees on either side framed Casey-Ann very nicely and the gravel road was perfect for our vision. After some standing poses we noticed a rustic looking chair on the deck. Casey-Ann's mom told us that they built these chairs, how cool is that? I feel that the denim jacket and cowboy boots really make this image standout. Not to mention how amazing Casey-Ann looks! We asked Casey-Ann to describe herself and what she enjoys doing. We feel that this helps us to plan each Grad session and make sure that all of our clients real personality comes through. In the summer months I spend almost all of my time horseback riding, and in the winter I downhill ski. For the past two seasons I have been a coach for Parkland Racers Ski team. When I am not competing at rodeos or gymkhannas with my horses I like to spend time with my friends and family. I am a responsible person, and am involved in lots of activities like Horseback riding, Edmonton Gymkhana Association, Warden Riding Club, Alberta High School Rodeo Association, Wild Rose Rodeo Association, Alberta Barrel Racing Association, Downhill skiing, Parkland Racers Ski Team. After graduation I plan on focusing most of my time on riding, specifically rodeo. The plan is to take one year off of school, travel, work and rodeo. My hobbies are horseback riding and skiing! As well as boating in the summer with family and fishing. My favorite music is country and rock. I enjoy music from Keith Urban, Eric Church, Jason Aldean, Carrie Undwerwood, AC/DC and Jack White. Location: 1000 Calahoo Rd, Spruce Grove, AB T7X 2T7.